It’s been a very busy week for Safex, with the first iteration of the Safex TestNet Blockchain in action and many new announcements being made every day. Here are the highlights from this week. Within the space of twelve hours the community was successfully able to compile, synchronise and start mining on the new Safex TestNet Blockchain. Early polls suggest that many are still curious to try out the TestNet, and some are waiting until the pre-compiled versions are released (Tweet 1, Tweet 2). Overall community sentiment is strong – many see the TestNet as a major milestone for the Safex project and are excited to see it develop further. I produced two videos explaining how to compile the TestNet Blockchain, and how to mine Safex Cash and perform simple transactions. We all know how passionate Daniel is about the design and utility of Safex Cash, and it’s economic model. In the latest video release, Daniel explains how an S-Curve Emission Schedule following the Diffusion of Innovation model will change the way people use cryptocurrency in day-to-day usage (Youtube Video). 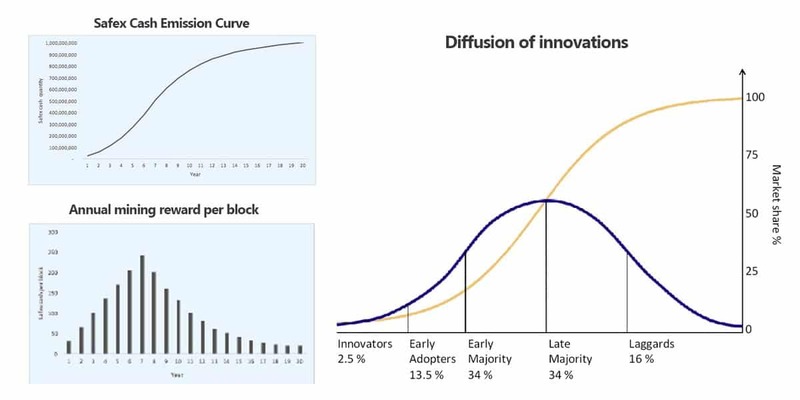 We wrote about the Diffusion of Innovations model a few months back – you can read about it here. This one shows you what can be accomplished by the Safex community. In a recent poll, the Coin Boys Podcast launched a contest to see which coin would get the most votes within 7 days. Safex was up against the NEM, SiaCoin, and Lisk communities which resulted in a total of 931 votes. Out of all the votes, Safex won by a staggering 54%, followed SiaCoin and Lisk at 21% and 20% (results). As a result of the competition, Coin Boys will be interviewing Daniel and asking any user submitted questions. You have until today (15/07/2017) to submit any questions you may have for Daniel (see Tweet). The Podcast will be released on the 25th of July. If you’ve been following Safex’s GitHub repository you’ll have noticed a few new commits relating to the BTC to CryptoNight bridge. This functionality is designed to migrate our existing Safex Coins over to the new blockchain (see Github). One that come as a shock to many in the community is that there is an Etherium ERC20 bridge being developed. According to Daniel, a close friend and member of the community offered to design and build a Bridge between the Etherium and Safex Blockchains (see Tweet). This would potentially allow for easier integration into the many decentralized Etherium based exchanges with little or no effort. Exact details of the project are yet to be expanded upon – right now it’s at a proof-of-concept phase being developed by an external party. If this can be pulled off, it could potentially increase our exchange reach exponentially. Keep an eye out for this one – it will be interesting! An issue many seem to be hung up on is that of exchange availability. Whilst many are excited about the recent TestNet launch, many are still curious as to Safex’s plans for future exchange listings. In a number of recent Tweet replies, Daniel confirms that exchange listings will be targeted as soon as the TestNet has been released (Tweet 1, Tweet 2, Tweet 3). When the subject of exchanges of raised on the Discord channel, Daniel confirmed they have a “Hit List” of exchanges they want to be listed on. Ivana Todorovic, Chief Operating Officer of Balkaneum and the mind behind the Safex Emission schedule, this week received her Masters Degree in Economics (see Tweet). It’s good to see that we’re in good hands. A huge congratulations to Ivana from all in the Safex Community! After a short delay due to some uncovered security concerns, the PLAAK Exchange team have confirmed they will be opening the doors for new members on Tuesday (see Tweet). At this stage, due to local regulations, trading is only available for Australian residents, with the USA markets expected to follow in the coming months. If you had previously registered for PLAAK at the beginning of June, you will need to re-apply and join the waiting list. For a bit of fun, the Safex and PLAAK communities played head-to-head in a game of Rocket League. This will be the first of many esports games to come and is a fun way for both communities to wind down after a busy week of crypto! The first match was recorded and will hopefully be uploaded in the next few days. If you’ve been following Daniel on Twitter you will have noticed he is in full-on promo-mode now. In a Tweet out to the community, Daniel has called out for any bloggers, Youtubers and podcasters who will be interested in interviewing Daniel. Likewise, if you have any suggestions then please feel free to raise directly with Daniel (see Tweet). Surprising the entire Safex community, news of a Safex related website begins circulating earlier today called Safex Five. Although unknown in origin, Daniel confirmed he is aware of the project and the people behind it. In what is suspected to be more than just a giveaway, Safex Five looks like it will be a Fiverr style service built on the Safex Blockchain. This is potentially the first of many externally developed projects that plan to utilize the Safex blockchain to handle transactions of goods and services. 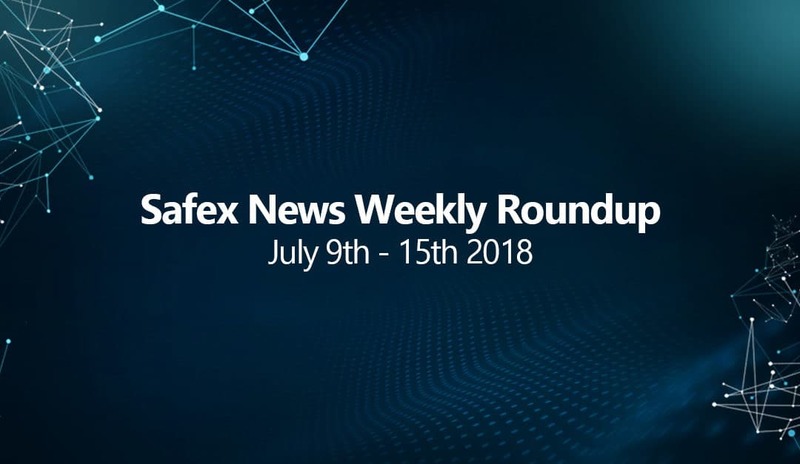 What seems to be a starter promotion, Safex Five are planning to give away a total of 200,000 Safex Coins to five winners if Safex reaches $5 by the 10th of August, as per John McAfee’s prediction several weeks back.